Thursdays are becoming one of our favorite days of the week! Getting a chance to look back at over 50 years in business and see how far Cookshack has come makes us optimistic for the future. Here is a little Throwback Thursday of Fast Eddy when he introduced the original PG1000. In 2010, Fast Eddy and Cookshack released the PG1000. 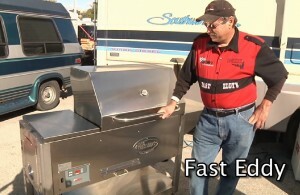 Fast Eddy used this technology in the 2010 American Royal and was able to showcase the power of the grill/smoker combo unit. This pellet grill did not have the warming drawer yet but still used the same great technology to smoke low and slow and also sear and grill. Ed “Fast Eddy” Maurin worked for the Kansas City Fire Department before he teamed up with Cookshack. He has always loved barbecue but did not like staying up all night to fight with a stick burning smoker oven. After working hard on his designs, Eddy went to market with a pellet smoker system that would change the barbecue industry. The Fast Eddy’s™ by Cookshack Pellet Fired Smoker Ovens and Pellet Grills are the easiest way to make delicious food without all the hassle!